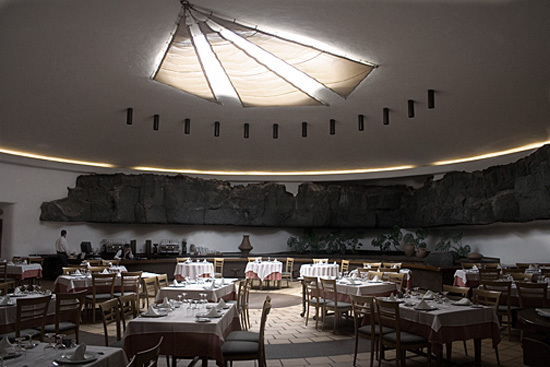 In the geographical center of Lanzarote, in a significant crossroads where we can reach any point of the island, highlights one of the works of César Manrique more full of symbolic references: the architectural complex of the Farmer’s Museum and Monument to fertility. 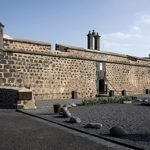 It consists of a series of buildings that are inspired by the traditional architecture of Lanzarote prototype, not playing a particular model exists, but combining the typical elements most characteristic of the different geographical areas of the island. 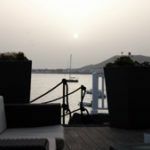 In it are elements as representative as fireplaces, eras, tanks, patios, carpentry, press, etc. 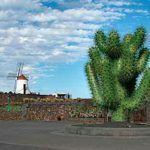 Cesar Manrique always showed his fascination with popular architecture, which was considered a symbol of identity and a distinctive feature of the island. In 1972 he compiled a book, Lanzarote, novel architecture, an extensive photographic inventory includes the most important examples of traditional architecture. 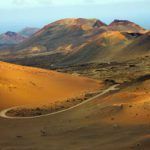 Isolated on the horizon, stands a monumental sculpture called “Fertility”, dedicated to rural Lanzarote. 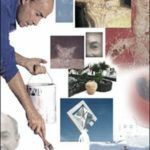 It is made with old sailing water tanks and other objects painted and assembled together, forming a set of geometric forms with high visual impact. The sculpture “Fertility” was released in 1968. 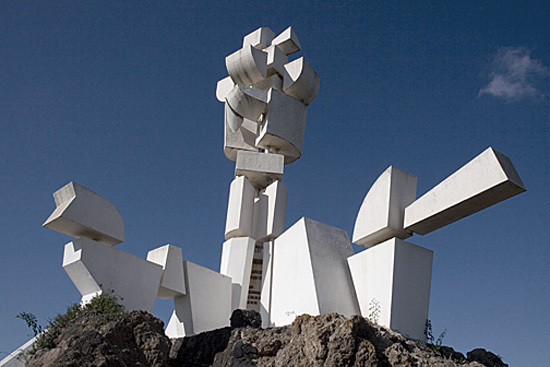 The design of the work is of Cesar Manrique and his clothing was given by Jesus Soto, associate of Caesar in almost every work space in Lanzarote. In the development had to solve various technical problems due to their complexity, not only by how high the work, 15 meters, but also caused by the resistance of the wind. Was used primarily concrete and iron. 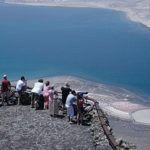 It rests on a mound of stones called La Peña de Tajaste, a small islet that was not affected by historic volcanic activity. Artistically, we highlight the audacity to have cubic structures that symbolize a person on a pack animal. The purity of the lines and modularity make this volume a magnificent sculpture reflects the avant-garde art. Regarding the group of buildings of the Casa-Museo del Campesino semicircular we can highlight that revolves around a central open plaza where many units are distributed. Within these we can see many objects and tools related to island culture and agriculture. The Farmer’s Museum and Memorial Fertility is a lucid, cutting-edge look on the island architecture and that, today, is renewed importance due mainly to the bridge established between the traditional and modern. 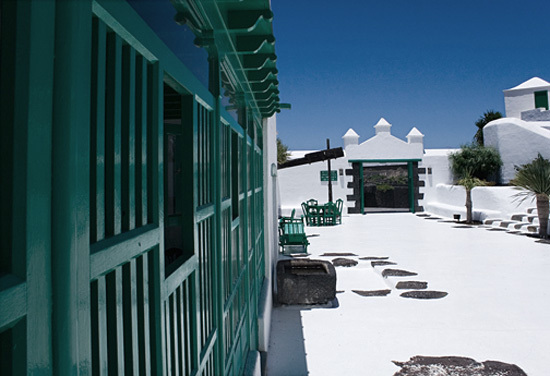 Continuing a project developed by Cesar Manrique before his death, other outbuildings were added. These were carried out inside an old quarry for the extraction of stone. 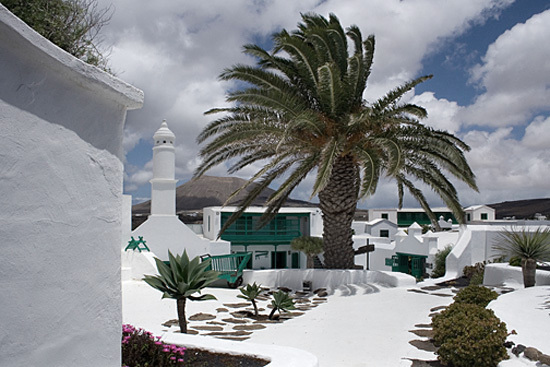 The works consisted mainly of the creation of new areas with specific uses: restaurant, sales center handicrafts, folk esplanade for exhibitions, craft workshops, etc … Monumento al Campesino is one of the establishments where visitors can taste Lanzarote traditional dishes of local gastronomy. The strategic location of the Farmer’s Museum and Memorial Fertility place it as the focal point from which different paths must start to make visits to other Centres of Art, Culture and Tourism. Visiting hours: Daily from 10:00 to 18:00.